I found the staff really helpful and understanding. 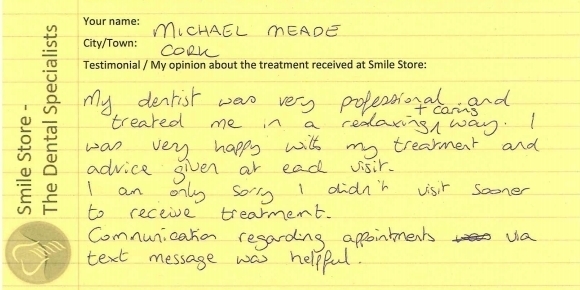 I was very nervous during the treatment but the staff helped reassure me. 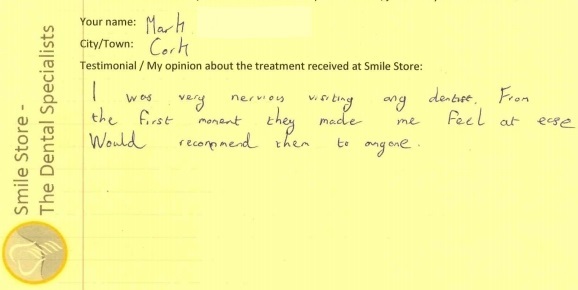 I would highly recommend Smile Store to my friends and family as it has given me back my confidence and smile again. Thank you Smile Store. Excellent cleaning procedure – very thorough. As a result, cavity was detected! My experiences of root canal procedure and crown procedure were pain free! Saved money too in that Smile Store charge less for crowns and root canals compared to other dentists. I enjoyed coming to my friendly, sincere dentist. From the beginning of my treatment the staff have been so kind and helpful. I am so grateful for your lovely welcoming treatment. I am so grateful and happy with my new crowns. Thank you so much. Great staff, excellent service. 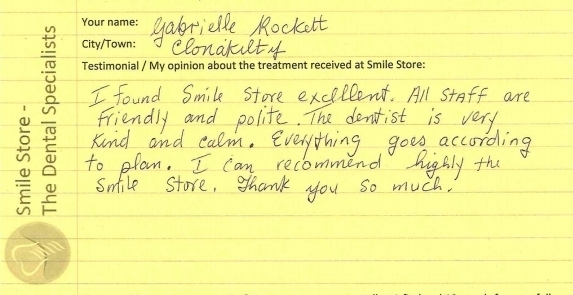 Would recommend the Smile Store for all services. Modern technology in the hands of professional, courteous staff makes treatment at the Smile Store a positive experience. I have lost my fear of dentists and most importantly I can smile again 🙂 Love their building in Togher and love there’s no smell of the dentist. Professional, fast, clean, relaxing dental experience. Best teeth clean of my life! Excellent. Have used Smile Store many times and always find them very efficient. 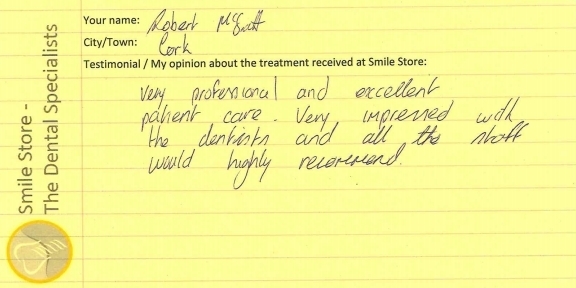 I found the whole experience from initial consultation to treatment to be nothing but excellent and would highly recommend Smile Store. Very pleased with the care I received. My crown and teeth cleaning were done very well. I will return. I’m very happy with all the work done to me and carried out by Orsolya who is an excellent dental specialist. Very good professional service and not left waiting for ages in the waiting room. Receptionist is very friendly. 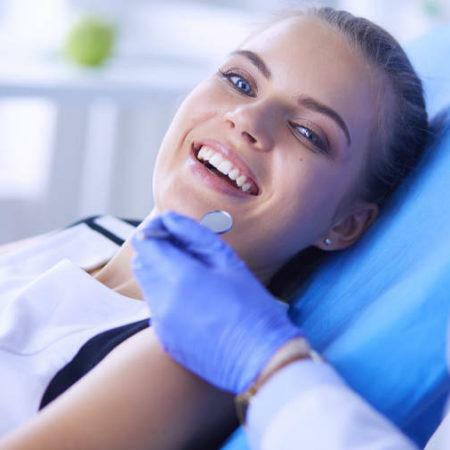 All the information required was given before the treatment and the treatment was performed as quickly as possible for no future wait during treatment. I followed all the instructions during the treatment and never felt any discomfort during the treatment: I recommend Smile Store service for such treatment. Excellent results from the treatment with full explanation of procedures and reasons for them along the way. Very friendly staff and everything done with efficiency and courtesy. High tech surgery, equipment at cutting edge. Appointments very punctual. Thorough explanation of all stages of treatment. Total professionalism. Dentist excellent. Reception very friendly and helpful. Prices very good. I have been coming here for over 2 years and I have had excellent teratment. Thank you. 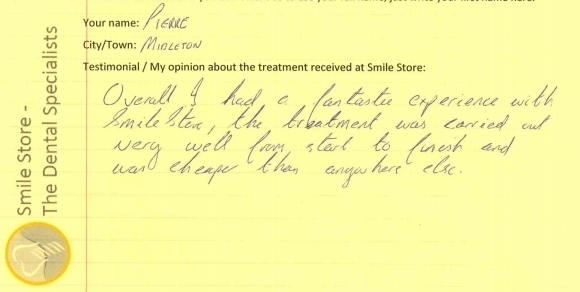 Overall I had a fantastic experience with Smile Store, the treatment was carried out very well from start to finish and was cheaper than anywhere else. I was very nervous visiting any dentist. From the first moment they made me feel at ease. Would recommend them to anyone. Extremely happy with my experience at the Smile Store. All staff are friendly and have a good sense of humour. I would always recommend the Smile Store to anyone asking about a dentist. Excellent from start to finish. Everything about my treatment was explained fully and clearly. Appointments were to suit my workday. My dentist and dental nurse explained everything during my appointments. 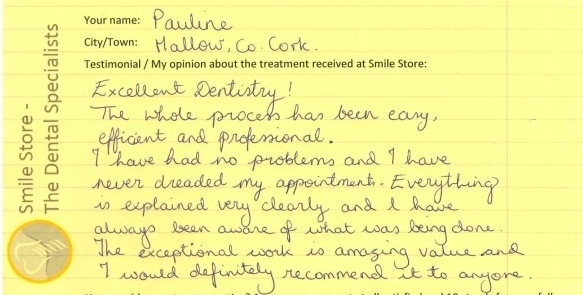 I have no problem in highly recommending Smile Store Cork to everyone. Thank you. 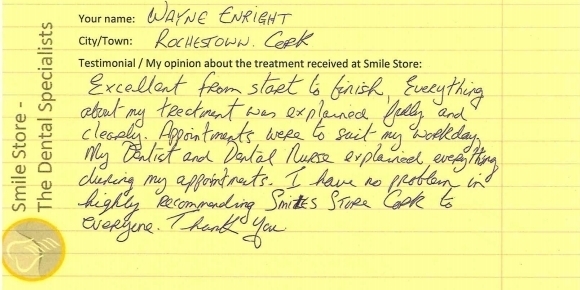 I am delighted with the treatment that I received at Smile Store. I had neglected my teeth for many years & had been putting off visiting a dentist as I knew I required extensive work & I was very nervous about it. From my first appointment I felt put at ease and knew I was in the hands of extremely competent professionals. 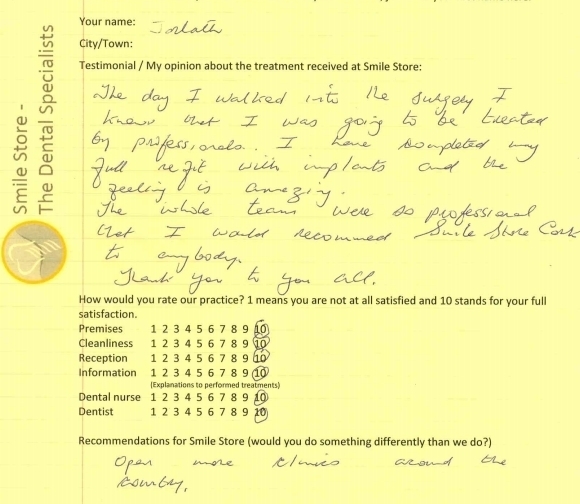 I am delighted with the results of the work & will be continuing to visit this practice. Very good, friendly and knowledgeable team. Excellent treatment given from day 1. I got given a plan so I knew exactly what needed to be done and what it would cost. Desislava always made me feel extremely comfortable and made the treatments as quick and painless as possible. I was never kept waiting for my appointments. The Smile Store carried out a repair to an old filling I’d had. They also recommended a comprehensive plan to repair & replace other damaged teeth. I’ve now completed this plan and am delighted with the quality of service I have received from reception, hygienest and dentists. I would highly recommend them on both quality of service and price. Excellent. My problem was taken care of quickly and effectively. A very impressive service. Punctuality + efficiency are of the highest standard. 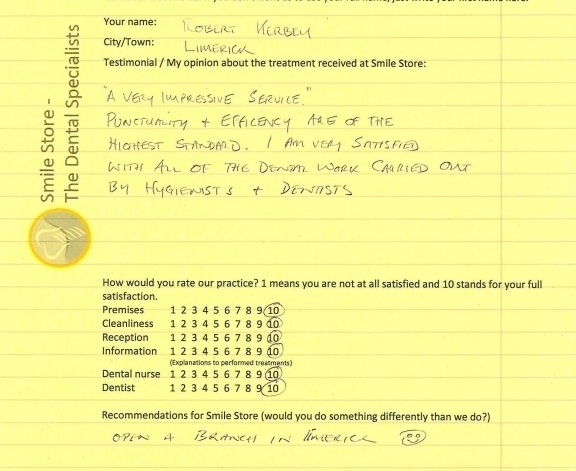 I am very satisfied with all of the dental work carried out by hygienist + dentists. 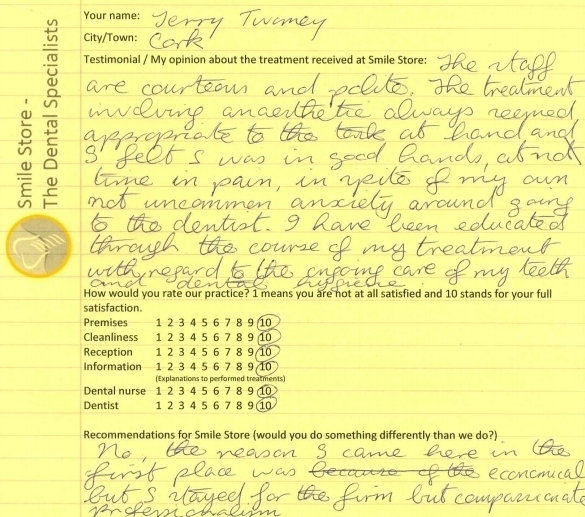 I felt very relaxed from my first contact with the receptionist, initial consultation and right through my treatment. They are all very patient, friendly and helpful. I would highly recommend Smile Store for all your dental requirements. I would recommend the Smile Store to everyone. The staff are extremely friendly and efficient. Everything is clear and precise and I could not recommend it highly enough! My whole experience was great and affordable too. Quick response to my initial enquiry and a positive response to my request for a rapid consultation. The information and programme of treatment was well laid out and explained. Everyone I met during my treatment was professional, courteous and pleasant. My treatment was first class. I felt welcome, safe and comfortable. 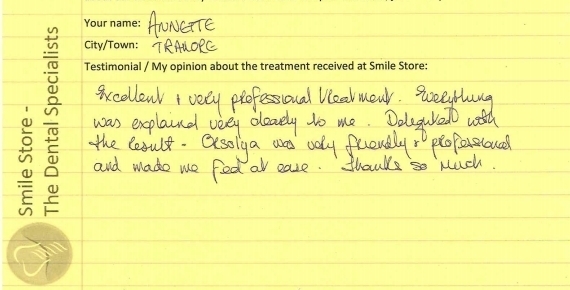 I was very happy with my particular treatments and would have no hesitation returning for more treatment if needed. Will have no hesitation in recommending service to family members and friends. Very professional, high standard of work, extremely courteous staff. 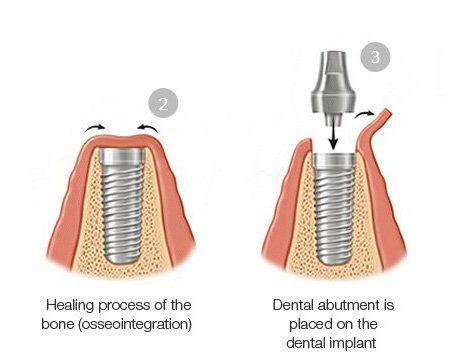 All procedures explained thoroughly throughout the process. Text reminders of pending appointments, “pay-as-you-go” helps to spread cost. Treatment really helped to straighten and fix my teeth up. Improved my teeth and made me more confident when smiling. I found the experience very professional, pleasant and courteous. I have recommended people to Smile Store. My dentist was very professional and treated me in a relaxing and caring way. 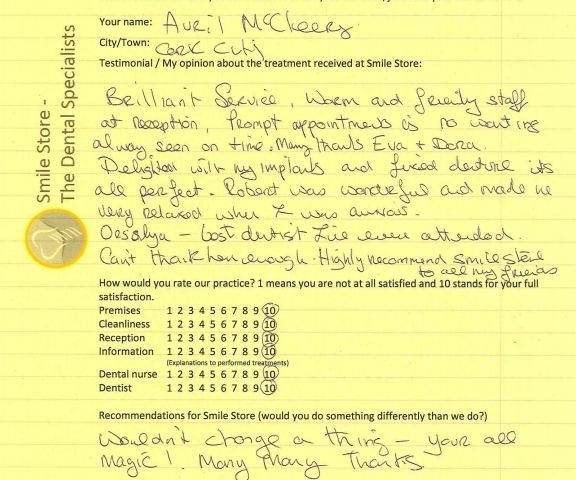 I was very happy with my treatment and advice given at each visit. I am only sorry I didn’t visit sooner to receive treatment. Communication regarding appointments via text message was helpful. I couldn’t recommend Smile Store enough. My treatment started in November, finished in March. I had 2 implants with a bridge between. From the start to the end the staff were excellent. The whole process was painless. 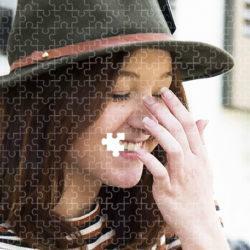 If you need dental treatment, don’t put it off, call Smile Store today, you won’t regret it. Very affordable. Great staff, extremely friendly & put you straight at ease. Do a wonderful job, very glad I came. I found Smile Store excellent. All staff are friendly and polite. The dentist is very kind and calm. Everything goes according to plan. I can recommend highly the Smile Store. Thank you so much. Excellent & very professional treatment. Everything was explained very clearly to me. Delighted with the result. Orsolya was very friendly & professional and made me feel at ease. Thanks so much. Professional, fast treatments and friendly informative staff. 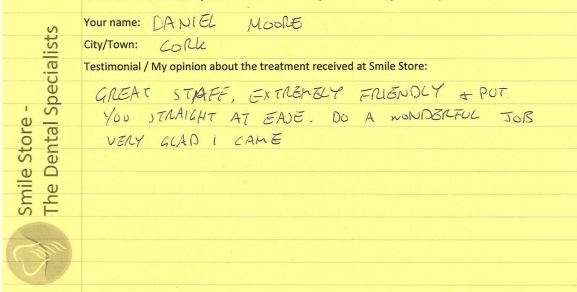 I am very happy with the treatment I received at Smile Store. All of the staff are very friendly, helpful and professional. I’d just like to say a big thank you to Dr. Orsolya Nemeth for the excellent dental treatment that I received before Christmas. A particular tooth had been problematic for a while but due to the perserverance and professionalism of this dentist over a number of visits, I no longer have any issues or pain. 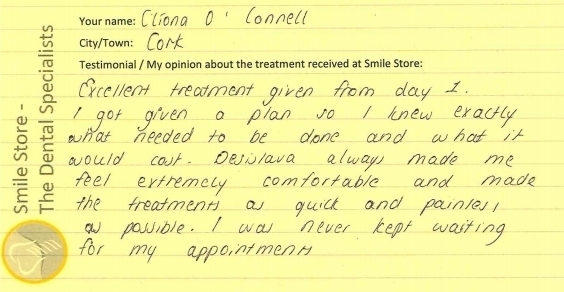 Keep up the great work Dr. Orsolya & all the Smile Store Team! As a person who has a major phobia about dentists . I have to say I’d highly recommend smile store. Every step was explained before the procedure and again before it was done . I never felt as my phobia was made little of or was silly. Thank you smile store my confidence in my smile is coming back ?